Whenever I go on vacation I try to learn something about the local cuisine. Often there is a lack of authentic vegan food though. Most of the time that means I impulse buy a cookbook, I write down ideas, I search the internet, I veganise one or two recipes. Then I move on because that vacation was only for a week and what could you possibly learn in a week? But what if it was possible to spend more time in a certain spot, what if there was a chance to really get to know both the people and their food? What if you have the time to create your own vegan versions of the food you see around you? That is exactly what Justin P. Moore did with his second book. 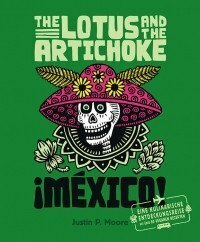 “The Lotus and the Artichoke ¡Mexico!” is about a three month trip the author and his family made to Mexico. In the introduction he talks about how easy it was to find vegan food there. He also got to know chefs and hosts who taught him a lot about the local cuisine. He then developed his own recipes inspired by the local cuisine and put them all together in his new book on Mexican cooking. The book is small and light and every recipe goes with a picture. Some of them were familiar to me because I already own Terry Hope Romero’s Vegan Latina book, but that way I can get a better understanding of this kind of food and learn about alternative preparation methods. All of the recipes I tried were simple and delicious. Because of the appetising pictures it was very hard to decide what to make. For this review I had to stop somewhere but I am not putting this book down anytime soon. The recipes are flexible and the author offers many ingredient alternatives and substitutions. I also like Justin’s attitude towards cooking. He doesn’t see it as an exact science and encourages his readers to experiment. I often found the ingredient lists a bit confusing though. Ingredients are not always listed in the order they are used. That can sometimes be uncomfortable, you have to go back to the book and find the ingredient you need to use next. 1. Mango-Limetten-Ceviche (Mango Lime Ceviche): I have to admit I was very sceptical about this recipe at first. I have never had ceviche before and had no idea what to expect. I liked the way the the tofu was prepared and that’s why I made it. 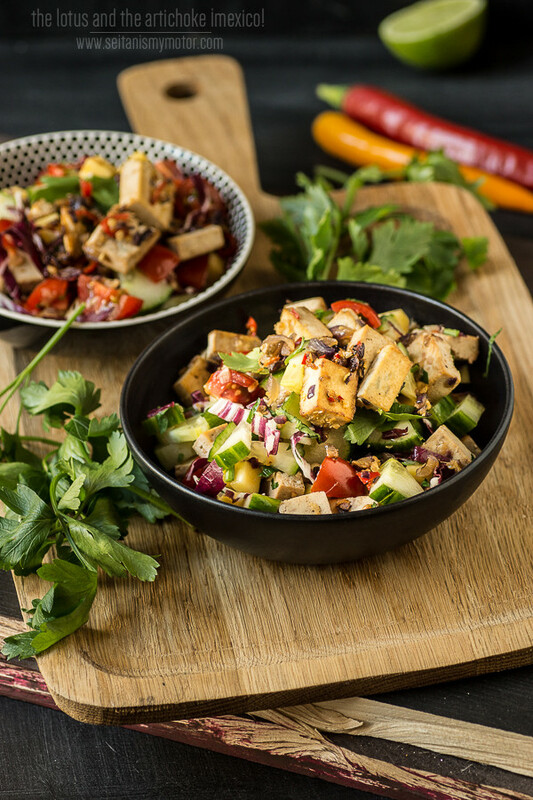 You sauté it with onions, garlic, ginger, anc chili and that is one of my favourite ways to prepare tofu. But then there were other ingredients like mango and radicchio and I honestly couldn’t imagine I would like that. Sweet and bitter and savoury? No, thank you. I made it anyway and I am so glad I did. This was the first recipe I tried and that was the one that won me over. There’s only a little radicchio and the tofu mango combination worked really well for me. 2. Caldo Tlalpeño: This soup reminded me of Hungarian goulash soup. 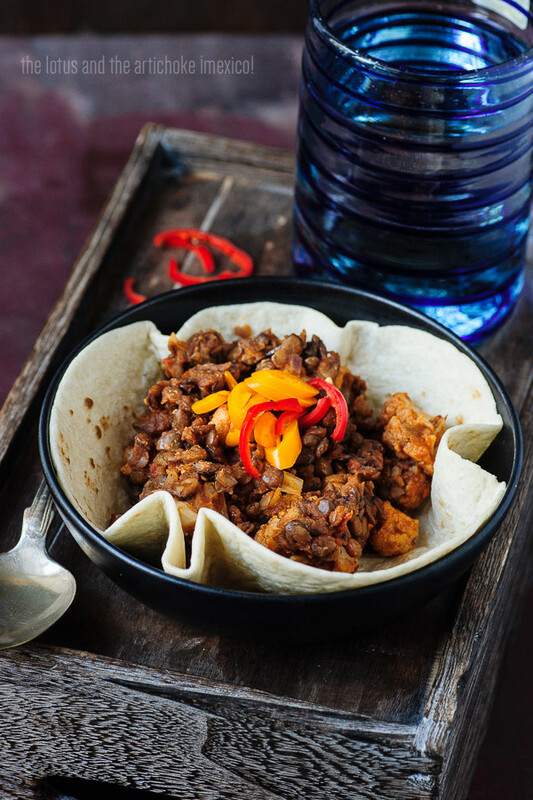 It’s made with TVP but the author suggests alternatives such as smoked tofu or seitan. I used the TVP and the soup came out very thick and chunky, which I liked a lot. It was a quick, tasty and comforting meal. 3. 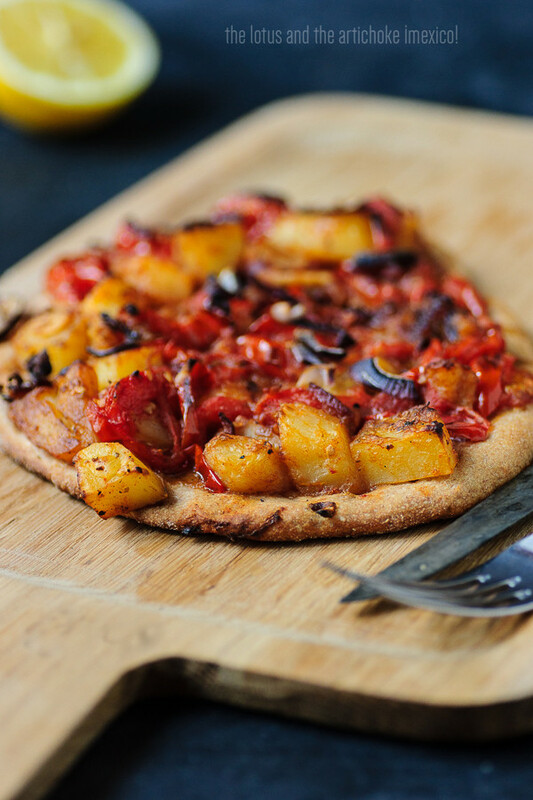 Pizza de Papas: This pizza is made by frying the topping before placing it on the pizza and I think that’s what makes this really special: crispy, aromatic, and spicy. We loved this a lot. 4. 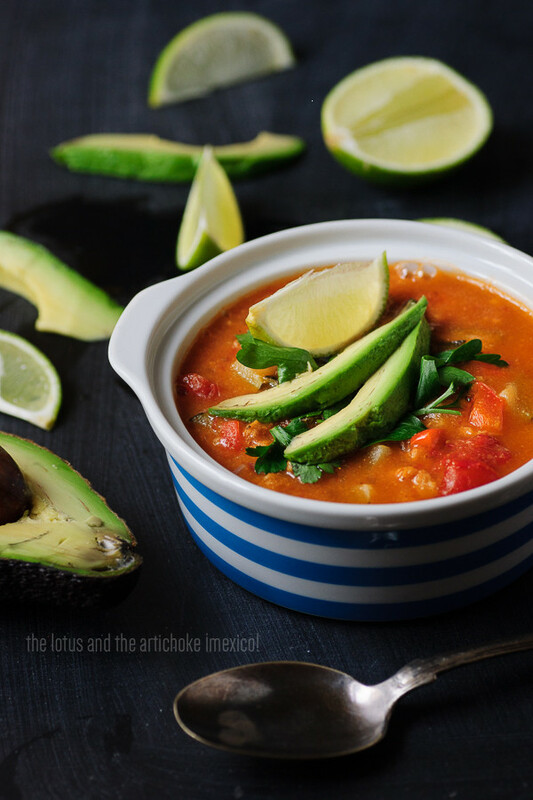 Tacos de Lentejas: The original version of this calls both for lentils and potatoes. I was out of potatoes so I used the suggested cauliflower as a substitute. I think the potato version is probably amazing, but the cauliflower version was, too! Like everything else this was delicious and filling. I am fortunate to have access to great organic wheat tortillas which taste like actual food, but if you can’t find decent tortillas Justin also has recipes both for flour and corn tortillas. 5. 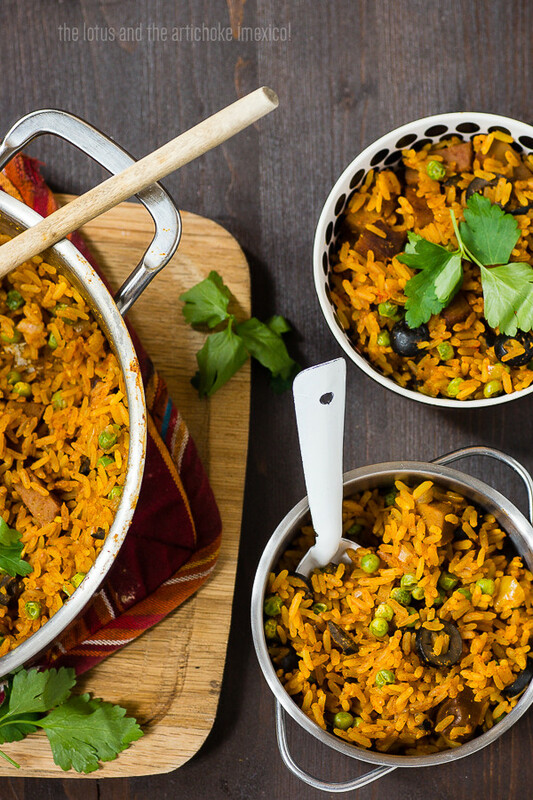 Mexican Magic Rice: Rice, seitan, and olives, for me the perfect comfort food. I’m repeating myself, I don’t know what else to say. This recipe was easy to make and delicious. It can be made ahead and then you can keep it in the fridge, take servings to work, eat its leftovers for lunch, etc. 6. Chimichurri Tofu: This was the only recipe that didn’t work for me. First of all the instructions didn’t seem very clear. It says to preheat the oven but doesn’t mention where to put the tofu. I used a baking dish but maybe a baking sheet would have been better? I also didn’t have enough sauce. The recipe calls for a bunch of parsley, which is usually about 50 g where I live. Next time I’d double it because it simply didn’t make enough for me. You are supposed to brush the tofu before and while baking. That didn’t work out because I had used up everything the first time around. And that was even though I had reduced the amount of tofu from 400 g to 300 g. I also didn’t like the preparation method because most of the hearbs looked pretty dark and wilted to me after baking. (But, mind you, that was only because I had already used up the sauce.) The sauce itself is good and I would probably make this again with a couple of changes. Either I would double the amount of sauce or I would pre-bake the tofu and also brush it wish some soy sauce. I would only add the sauce at the end of the cooking time, maybe 10 minutes before the tofu is done baking. Sometimes things go wrong and that shouldn’t reflect badly on this cookbook because I think it is an inspiring book full of interesting and delicious recipes. They call for fresh vegetables and herbs, are easy to prepare and don’t take super long to prepare. I am very happy that this book is now a part of my cookbook shelf and I am looking forward to making more amazing recipes from it. The Lotus and the Artichoke ¡Mexico! is a new vegan cookbook by Justin P Moore. I reviewed the German version but the English version is available, too. Justin has another cookbook out, which you can check it out here. Don’t forget to browse through the recipe section on Justin’s page, where he features many of his awesome international recipes. I got my review copy for free from the publisher Ventil Verlag. ich habe das Buch direkt nach dem Erscheinen gekauft, da ich vom Vorgängerbuch schon sehr begeistert war. Bisher bin ich noch nicht mal zum Durchblättern des Buches gekommen, werde das aber ganz bald nachholen, wenn ich mir deine Bilder so anschaue. ich danke dir für deine Rezension – die Fotos sehen absolut großartig aus und machen direkt Lust auf die lateinamerikanische Küche, an die ich mich bislang noch gar nicht heran getraut habe. Ich habe zwar das Vorgängerbuch, aber noch kein Rezept nachgekocht, da ich mich bislang nicht so recht dafür begeistern konnte. Wenn ich deine Bilder betrachte und die Rezension lese, muss ich sagen, dass ich mein olles Kochbuch doch noch einmal aus der Versenkung holen muss und dmich im munteren Nachkochen üben werde! I’ve not eaten a lot of Mexican food before, but these all look delicious! Especially the Mango Lime Ceviche. Yum! This cookbook looks awesome! I love Viva Vegan too, but I have had to make substitutions in a few of the recipes I’ve tried because some ingredients weren’t as easy to find over here, so it’s good to read that this book offers extra suggestions for that. Everything you made looks super good. 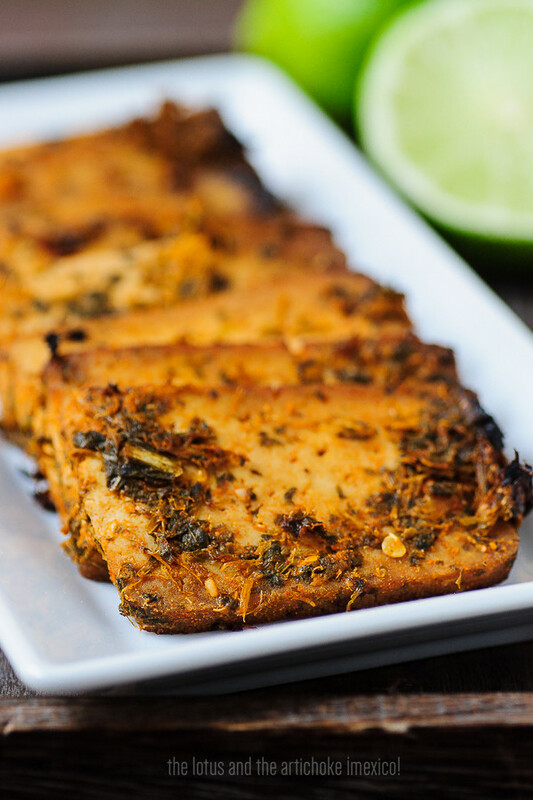 I’ve also made chimichurri tofu and tempeh based on the recipe from the PPK blog and I really liked those, but yeah, I suppose bunches of parsley can vary in size quite a bit. Das sieht ja lecker aus! Die Gerichte machen wahnsinnig Lust zum Nachkochen. The food looks delicious and is all beautifully photographed! Particularly the flatbread, that sounds phenomenal. I was just watching an episode of a cooking competition TV show where the chefs had to make authentic Mexican food, and the chef who made the meatless dish was declared the winner because it’s most authentic to let the produce be the star. It’s a great cuisine for vegans and I’m glad that this cookbook is showcasing that! Yes, that is exactly what I think, too. The produce is the star and is enhanced by fresh herbs and great spice combinations. So simle and so good. I love Mexican food, and wowzers, all your pictures really do the recipes justice! They look mouth wateringly good! I had never heard of this cookbook, but now I want to add it to neverending list that I want to make mine. I love Mexican food! And that cookbook title and cover are pure awesome.